More than 50,000 killed, more than three million forced to flee their homes, and millions more in need of humanitarian assistance, medical treatment for cholera epidemics and wells to secure water. The UN reports that: The country is right no in the grip of a food crisis that threatens millions of lives. As many as five million people struggle to have enough to eat. What are we doing about it? 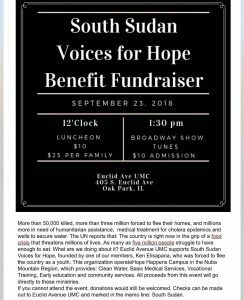 Euclid Avenue UMC supports South Sudan Voices for Hope, founded by one of our members, Ken Elisapana, who was forced to flee the country as a youth. This organization operas Hope Happens Campus in the Nuba Mountain Region, which provides: Clean Water, Basic Medical Services, Vocational Training, Early education, and community services. All proceeds from this event will go directly to these ministries. 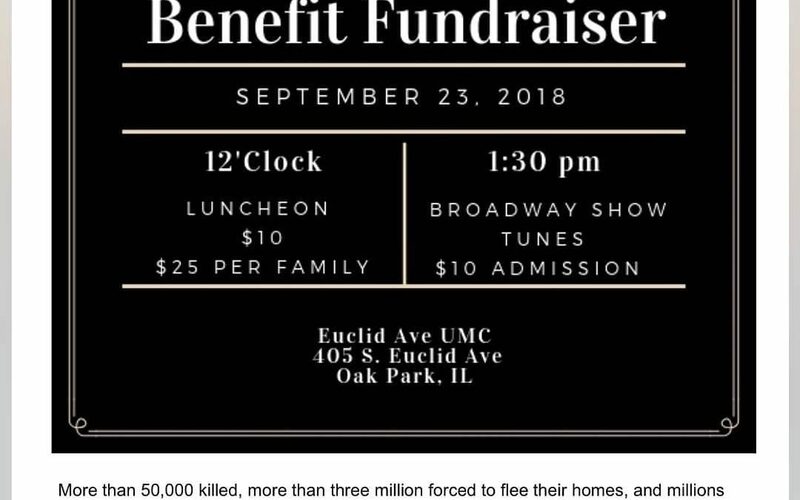 If you cannot attend the event, donations would still be welcomed. Checks can be made out to Euclid Avenue UMC and marked in the memo line: South Sudan.